Good domestic economic news was overshadowed by renewed concerns over the Greek bailout this week. After rising early in the week, most major indexes pulled back on Friday to end the week modestly higher. The S&P 500 inched up slightly higher to 0.1% while the Dow Jones Industrial Average eked higher by 0.3%. The Nasdaq Composite fell slightly by 0.3%. Investor attention this week will shift to the Federal Reserve. The Open Market Committee meets on Tuesday and Wednesday. While no rate hikes are expected after this meeting, market prognosticators will be looking for signs of a September or December lift off. 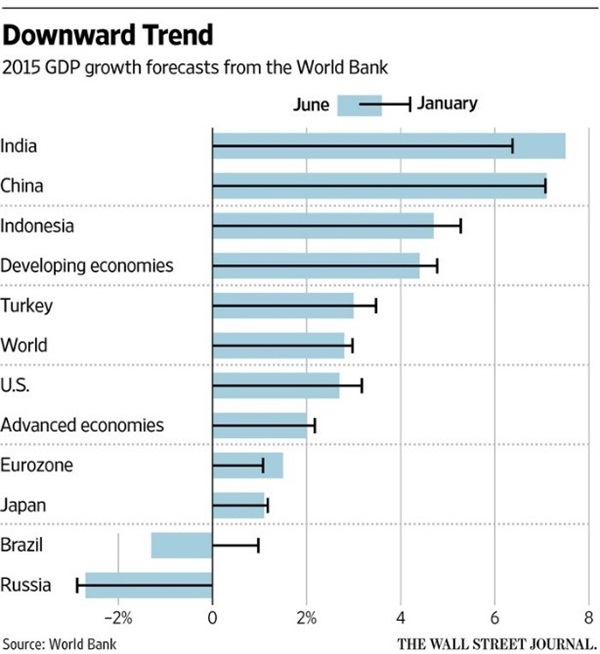 Last week the World Bank cut its forecast for global growth in 2015 to just 2.8%, down from the 3% it projected early in the year. The development organization cited pullbacks in several emerging market countries including Brazil, Russia, Turkey and Indonesia as a key reason for lowered growth prospects. Despite these headwinds, the bank expects growth to accelerate to 3.3% as developed economies continue to gain momentum. This improvement for next year also assumes there is no repeat of 2013’s taper tantrum as the Federal Reserve raises rates. Back then, emerging market bond and equity markets sold off when then chairman, Ben Bernanke, signaled an end to quantitative easing. There are several different ways to measure the value of the stock market. The preferred method of Warren Buffet is currently flashing some warnings signs. The Oracle of Omaha looks at the ratio of the market value of publicly traded companies to gross national product. 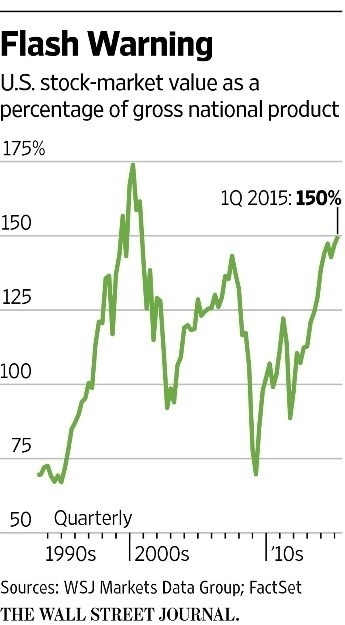 At 150%, this is the highest it has been since 2000, and well above the historic average of 119%. Nearly 15 years ago, Buffet wrote that he considered equities cheap if this ratio falls into the 70-80% range. However, at Berkshire Hathaway’s recent annual meeting, he mentioned that interest rates are going to shape his current view on equities, concluding that stocks look cheap if we continue to have low interest rates. While equity markets have had a higher percentage of days with 1% moves this year than last, the S&P 500 has traded in the smallest range since 1995 and the volatility witnessed in the early part of the year has dissipated. The S&P 500’s 2015 low is only 6.5% below its high well off the double-digit average for the past several years. The same is true for individual names within the index. 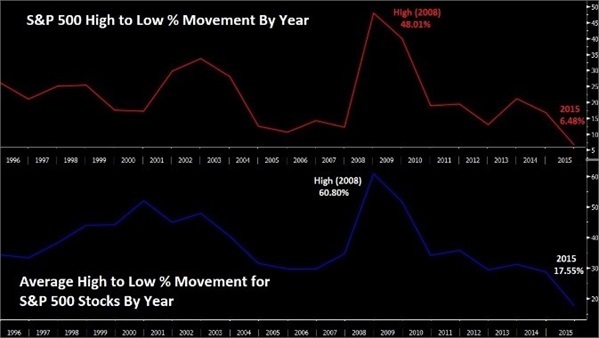 The average high to low percentage move is just below 18%, nearly half of the long-term average. Another piece of evidence that the market has remained within a narrow band this year is stocks are just 5% below the average price for the past 100 days. And, the S&P 500 has just finished its seventh straight week with a move of less than 1%, the longest stretch since 1994. “Do I really sound like that?” If you’ve ever heard your own voice on a recording, you’ve probably uttered this question. Why does your voice sound different in your head than it does when you listen to it on a recording? The answer actually has a lot to do with your head. When you hear yourself speak, the sound reaches your brain through two channels: air conduction and bone conduction. Air conduction is the sound waves traveling from your mouth through the air and into your ear. This is how everyone else hears your voice. Bone conduction occurs from the vibrations in your vocal chords. These vibrations travel through your bones and skull to reach the inner ear. But here’s the thing. The acoustics in your skull are much better at conducting lower frequency sound waves, making the voice in your head sound deeper than it does to others. This is why we often cringe when we hear ourselves speak on a recording, and we often sound like a higher pitched version of what we think we sound like.